Radford Garage Door provide quality service & repair on most make and model garage doors and garage door operators. Your garage door/s and garage door opener need to be maintained to function right and keep them safe. Our annual tune-ups prevent minor problems from turning into expensive repair also help to extend the life of your garage door/s and the garage door opener/s while keeping them safe, quiet and dependable. Repair and service both sectional and one-piece garage doors. Replace of broken torsion springs and broken cable. 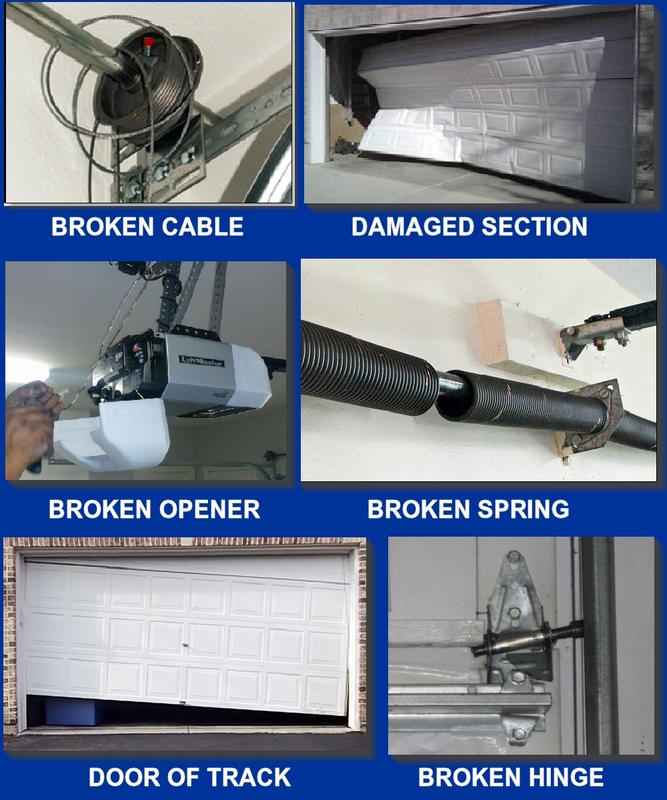 We offer a Lifetime Warranty on garage door torsion spring replacement (please call for detail). Our replacement torsion springs are the highest quality available in the industry. Replace/repair of damage or broken garage door section/s. Safety check-up and maintenance of garage door and opener. Replace of one-piece door hardware and spring. We carry Parts for most brand/brand of garage door operators. Second Opinion. Please call us if you are considering a second opinion. Q. What are common sizes of residential garage doors? A. Most doors fall into two common categories - single-care and double-car. The two most common single-car doors sizes are 8'x7' and 9'x7 (width x height) and the most common double-car door is 16'x7'. Some homes built in the last ten years have 18’ wide and 8' high doors to accommodate larger trucks and SUVs. Q. I heard a loud noise in my garage and now my door isn't working. What is the problem? A. More than likely, the problem is a broken spring. 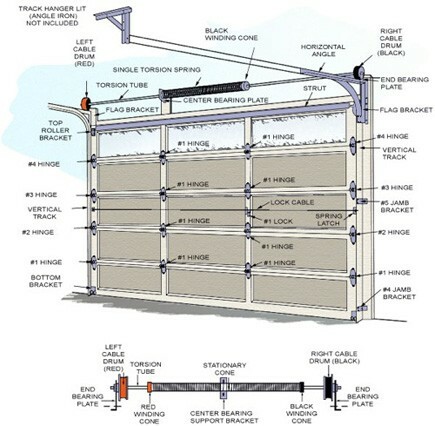 The torsion or extension springs on garage doors act as a counterbalance to lift the heavy doors. Springs break after extended usage and when they do a very loud noise can be heard. Q. The door comes up halfway and gets stuck. A. he force of the opener may need adjustment or the opener may need lubrication. Also, the springs may be out of balance putting undo stress on the opener. Q. My door is hard to lift or seems heavy. A. The springs probably need balancing and have the amount of tension adjusted. Q. My door will not close at certain times of the day but not others. What is the problem? A. Sunlight is probably interfering with the photocell system with your garage door opener. The sending and receiving eyes need to be swapped. Q. My door is making loud noises when it operates. A. We've found that our fifteen-point inspection will solve most noise-related issues. We will make adjustments to the door and opener to solve the problems causing the noise. Q. Are new rollers necessary when servicing a garage door? A. It depends on the amount of wear they've undergone. The entire weight of the garage door must move along the tracks via the load bearing points, the rollers. Q. What is the difference between the garage door openers you sell versus the ones I could buy from Home Depot or Lowes? professional grade opener for as low as $295 in about one hour and it will be warranted for one year. Q. Are replacement sections available for garage doors? A. Replacement sections are available for some steel and wood doors if the model of the door is still manufactured. Exposure to the elements over time will alter the color of the sections therefore; a replacement may not be a perfect match to your existing sections. Q. Can I fix the door myself? A. A garage door is the largest and heaviest moving object in your home. The springs, cables and bottom fixtures are under extreme loads and if not balanced and calibrated properly can cause property damage and potentially dangerous or even deadly consequences. Incorrect installation or repair can also void warranties. Don’t fix it yourself! A professional can handle the job for you quickly and the cost difference is minimal. Q. Does a garage door require maintenance? A. Your garage door is the largest and heaviest moving object in your home. We recommend that the door be serviced every 6 month. Please call our service department at (858) 751- 0666 or (619) 239-8558 to schedule a service call. Q. Can I paint my garage door? A. Steel doors can be painted with any high quality exterior latex paint. Wood doors must be painted or stained prior to or immediately following installation. Most steel garage door models are available primed from the factory. RADFORD DOORS recommends that wood doors be repainted/ restrained every 2 to 3 years. © Copyright 2019 Fred Lou. All Rights Reserved. Radford Garage Doors is San Diego’s Premier Garage Door Company. We have been selling, installing, repairing and maintaining residential garage doors and openers since 1945. During the past 73 years Radford Garage Doors has worked for many of San Diego’s homeowners, HOA’s, property management companies, home warranty insurance companies, developers and contractors. Radford Garage Doors offers a vast range of custom wood, custom aluminum glass, custom copper faux wood, fiberglass, steel wood grain and steel garage doors in different design options from traditional to modern and contemporary. As a locally and family owned San Diego company we take pride in our reputation for quality products and workmanship, timely delivery and excellent customer service. All of our installers are company employees and not subcontracted labor. We are proud to say that over the years we have accumulated a substantial list of satisfied clients. Radford Garage Door offers the largest collection of garage doors in San Diego. We design and create unique and beautiful custom garage doors that will provide an attractive finishing touch to improve the appearance of your house and increase your home's value. We hope the provided information and our website photo gallery for different garage doors will be helpful for you. We are looking forward to assisting you with choosing a garage door that is unique and matches your home's style. Please feel free to visit our premier showroom, or contact us via e-mail or phone with any questions or concerns you may have. We look forward to assisting you with finding the perfect garage door for YOUR home! Our showroom is located at 9185-9187 Chesapeake drive, San Diego, CA 92123. The showroom opens Monday through Friday 9:00am to 4:00pm, Saturday by appointment. Thank you again for selecting us. It is our privilege to work with you.